UFC 18, held on January 8, 1999, in the New Orleans suburb of Kenner, La., was based around a man promoted in the show's advertising as the greatest martial artist in the world, Bas Rutten. Rutten, who hadn't lost in nearly four years of fighting a regular schedule in Japan, debuted against Tsuyoshi Kosaka, in a match that was a far bigger deal in Japan than in the U.S. Rutten was the top fighter in the Pancrase promotion at the time, while Kosaka was a star in a unique rival promotion called RINGS, where they did both pro wrestling and legitimate matches on the same events, with Kosaka being a star in both. In the early moments, it appeared the hype was misguided, as Kosaka took Rutten down and was beating Rutten on the ground. Ref John McCarthy called two controversial stand-ups, considering the ground work between the two was at a much higher level than usually seen in UFC, and the action had never slowed. Kosaka also had damaged Rutten, cutting his eye. The turning point of the match came after the second stand-up, as Rutten threw a devastating kick to Kosaka's knee, and the usually stone-faced Japanese grappler winced in pain. The knee was damaged bad enough that Kosaka no longer had the leg drive to take Rutten down. Rutten, a master kickboxer, took control from there, putting the fight away with strikes with 45 seconds left in overtime of a match he may have lost the decision in. 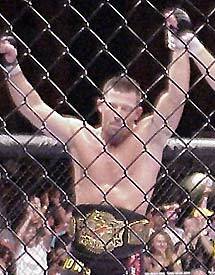 Pat Miletich was the first holder of what is now the UFC welterweight title. Pat Miletich retained the lightweight title, winning a double overtime decision over Brazilian Jorge Patino in a largely dull fight, winning by scoring a number of takedowns. Two people who would go onto major stardom fought underneath. Future UFC middleweight champ Evan Tanner defeated former national champion wrestler Darryl Gholar, coming from behind with punches and knees before winning with a choke. The other saw the first person to take the art of weight cutting to a new level, in Tito Ortiz. Ortiz had fought in UFC a few years earlier, but came back, weighing in at 199.8 pounds after cutting, and walked into the octagon at 218 pounds. With his size and superior striking, believe it or not, he completely dominated Jerry Bohlander, who at the time was a heavy favorite and considered one of the best under-200 pound fighters in the world. Ortiz bloodied Bohlander up, and McCarthy stopped the fight with 29 seconds left in overtime. In what became the beginning of probably the biggest feud in UFC history, after the win, Ortiz, with his fingers, acted like he was shooting at the Lion's Den corner, and coach Ken Shamrock. Another Lion's Den fighter, Mikey Burnett, dominated standing in winning a decision over Townsend Saunders, an impressive performance because the Olympic silver medal winning wrestler was unable to take Burnett down. Kosaka later became not only the first fighter to hold Antonio Rodrigo Nogueira to a draw, but also the only fighter ever to score a win, controversial due to a blood stoppage, but a win nonetheless, over Fedor Emelianenko. Ortiz vs. Bohlander had its back story. The two had wrestled in the California high school state tournament, with Ortiz winning. Ortiz first got into training for UFC because he had watched a tape of a show, and saw Bohlander as a star, and recognized him from his high school days, and figured if Bohlander could be a star, so could he.